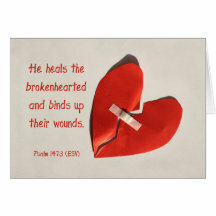 Psalm 147:3 tells of Jesus as the healer of broken hearts: He heals the brokenhearted and binds up their wounds. This verse is depicted in this Scripture art image of a red crumpled paper broken heart. The red heart is cut down the middle in jagged line and then put back together with a band-aid. The text of Psalm 147:3 appears beside the heart in a casual typeface which has a subtle grunge effect. 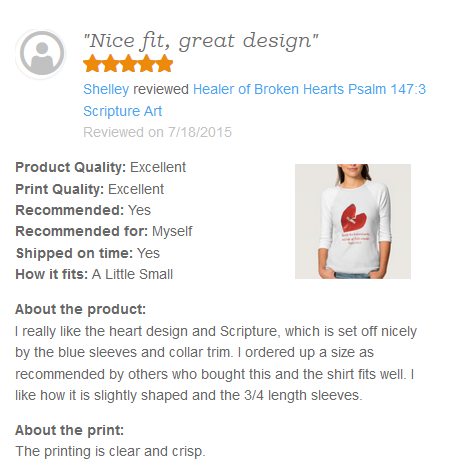 The red paper heart and red text of the Bible verse stand out vividly against a light beige paper texture. 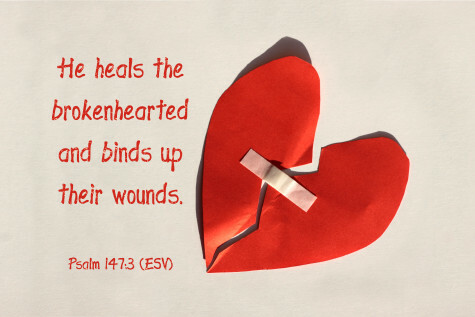 Just as Jesus was a healer of broken hearts, we are called to do the same. This Scripture art makes a nice gift to cheer and encourage anyone dealing with grief, sorrow, heartbreak, physical ills, sickness, depression and more. 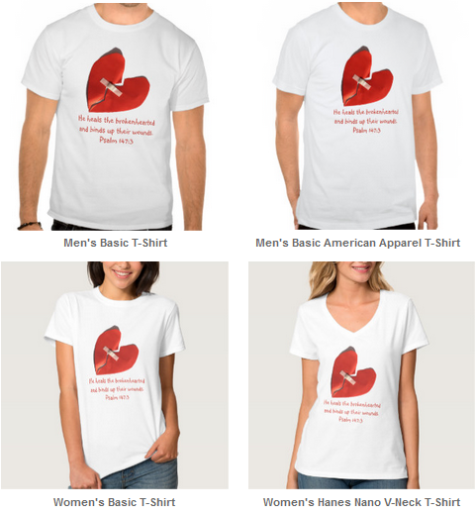 The Healer of Broken Hearts T-Shirt is a popular gift item! Greeting cards and postcards are also a nice way to cheer someone with this Bible verse. Here is a random assortment of more gift items with the Psalm 147:3 Scripture art. Really nice and simple designs. Jesus is all capable and he is the Saviour. May all broken hearts be repaired by his holy grace. Thanks Mary.